La Shish Taouk is the only Lebanese restaurant I’ve dined at to date and I’ve been there many, many times since, particularly when I’m itching for inexpensive take out that will last several days. On this particular visit, we went with the humans’ family so we could try a few different items. The Mayfield location is large and spacious, with ample seating. Unlike their downtown location where it is mainly take out, this location offers take out, as well as sit down restaurant service. The female human ordered a combination plate, which consisted of chicken and feeb shawarma, sliced and served with rice, garlic sauce, tahini sauce, Lebanese salad and pickles. The rice was well seasoned, the salad very light and refreshing, the garlic sauce extremely garlicky, but the tahini had a nice kick to it. 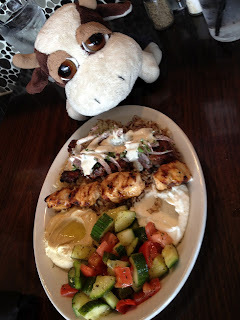 The chicken shawarma had a subtle charbroiled taste to it, but was still moist, and the human said the feeb shawarma was very flavorful and tender, albeit a tad on the dry side. The shish combo consisted of charbroiled shish taouk, shish kabob, shish kafta, served with tahini sauce, onions, Lebanese Salad and pickles. The chicken and feeb, although skewered, tasted exactly like the shawarma, but also included a very unfortunate meatball, which the humans said tasted like a very dry meatloaf. The Ghellayee consisted of cubed chicken, sauteed with mushrooms, green and red peppers, garlic, and onions served with rice and pickles. It had a sweet and sour taste with a bit of heat to it. The feeb shawarma consisted of freshly marinated feeb, charbroiled, sliced and served with rice, Hummus, onions, tahini sauce, Lebanese Salad and pickles. The man human enjoyed his feeb shawarma too much to speak, or spend time to describe it to us. Overall, most of the food was well seasoned, tasty, and very quick, even though some of the meat was a bit on the dry side. We admitted defeat part way through our dishes and had to opt to take the rest home to enjoy another day. A great place to go for a quick, inexpensive, tasty, and abundant meal.